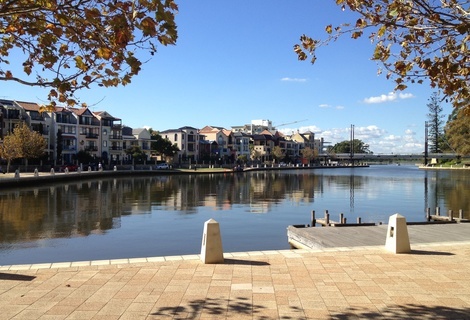 Great waterfront bar in trendy East Perth. The Royal was reviewed on Wednesday 28th December 2011 13:38 by Richard. 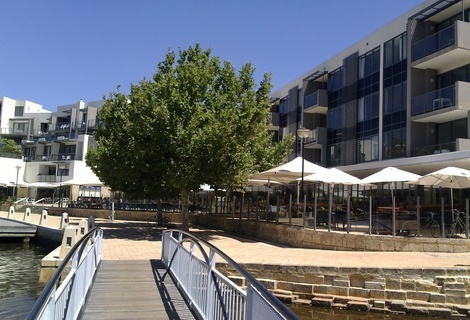 I'd argue that The Royal is situated in one of the best locations of any pub in Perth, right on the waterfront in east Perth secluded from busy streets and nosey people passing by gawking at your food, like so many of the street side "alfrescos" in Perth. We went on a balmy 40 degree summers day, the heat was unbearable so we decided find a spot inside, although they did have those water/mist sprinklers outside to help patrons deal with the heat. We found a quiet booth style table in the bar area which each had a small flatscreen mounted on the dividers showing the cricket. I ordered our meals at the bar and was pretty surprised when I was told "No you can't order a steak sandwich at the bar" even though they are cooked in the same kitchen as the food for the restaurant, where you have the permission to order a steak sandwich. You would think that a "steak sanga" is more likely to be found on the bar menu than the restaurant one. The bar menu seems to be a cut down version of the restaurant menu and to me, it doesn't seem like it would require a brain surgeon to put a steak sandwich on a plate instead of a burger (which is on the bar menu). Maybe it would cause an apocalyptic event if a steak sandwich ever found its way into the bar area or maybe it would make the wait staffs' heads explode if the destination of a steak sandwich was anywhere else but the restaurant. Steak sandwich fiasco aside, the bar and table service was pretty good, staff were friendly and wait times for food and drinks were minimal given it was the lunch hour rush. When ordering at the bar we were provided with cutlery and a table number and the food was then brought to the table. I ordered the lemon chicken pizza and my mate ordered the hamburger. The food came out a bit cold, porbably because it was sitting for a while before being served. It wasn't ice cold but it could definitely have been warmer especially the chips that came with the burger, there's nothing worse than cold chips. The pizza was only a h "half slab" but was big enough for one person and it had some good flavours going on, it had just the right amount of chilli which was countered nicely by the lemon marinade on the chicken, however it could've done with some more toppings (one small piece of chicken per slice and a stingey amount of capsicum was about it). The Asian inspired sauce was also quite tasty and helped in countering the mild bite from the chilli. The Burger was quite bland and needed more seasoning/flavour in the patty and some more flavour from something like a tomato relish or a garlic aioli. The chips had a great seasoning on them and probably would've saved the dish somewhat if they had been warmer than room temperature. 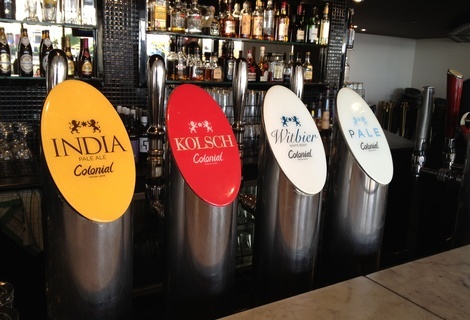 There is quite an impressive range of both beer and wine and seeing as it is owned by the same people that own colonial brewing company (local WA brewer) there is also a selection of freshly brewed Colonial beers on tap. Drinks are priced on the more reasonable side of average which can't be said for the food. The food is leaning to the pricer side of the spectrum and the quality was just not there to back it up on the day. We will definitely give it another go as in our experience it is pretty rare that they miss the mark on food quality.